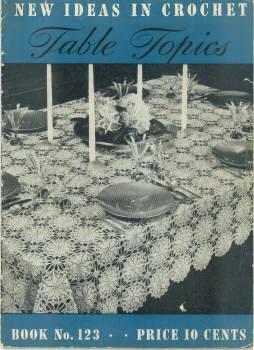 Star Wheel Tablecloth #744- Oh, the HORROR! Editor’s Note: I’ve found the pattern I wrote out, and the motif has been identified correctly now. Not the Pinwheel , as previously posted. 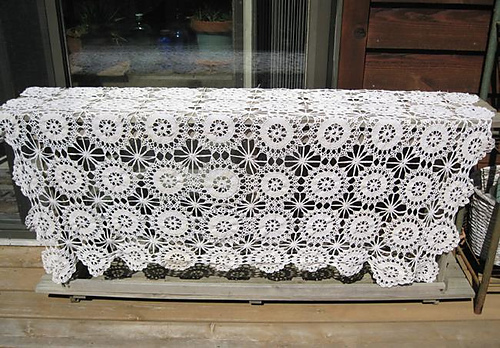 I made this tablecloth back in the early 80’s during a time when I was enjoying a bit of down-time, between babies. 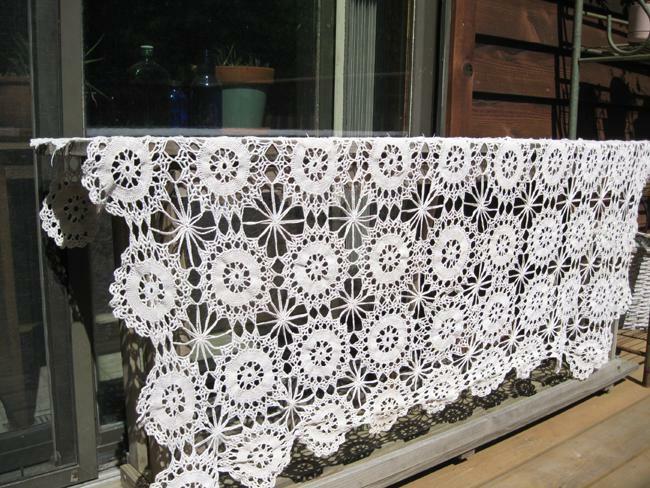 The Pattern is from New Ideas In Crochet Table Topics – The Spool Cotton Book No. 123 . It had what appeared to be a nasty coffee-and-cream stain on one edge motif, and a few drops on a couple others in the immediate area. It was stiff and very dark, UGH! 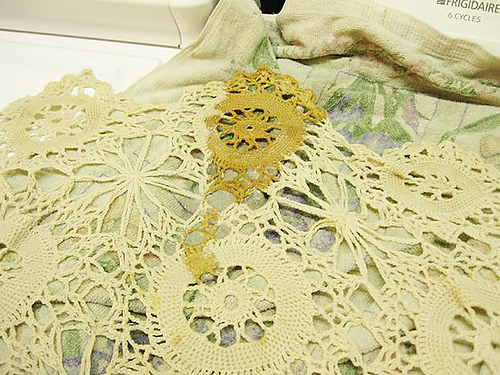 I posted these pictures and my dilema in my Ravelry Forum, in hopes someone could suggest a possible solution that would rid the stain without my having to remove the spoiled motifs. A couple suggested I use Oxy-Clean and soak it. So when I went to pick up DD18 from work last night, I grabbed a small bottle of Oxy-clean and promptly made a bucket of water for a soaker. The bottle said to leave in up to 6 hours, but after 3 hours, I could see it needed to stay in longer, so I left it in the bucket in the tub, overnight. This morning, I was pleased to find The Stain was reduced to a shadow of it’s former self, and now appeared as a faded tea stain. WAIT: another Ravelor suggested as she cannot see the stain as being that bad at all, why not leave it as is, like part of the cloth’s history to the story. Gives it “Patina, as it were”. What a beautiful tablecloth! Have you tried Spray N Wash? I use it for getting stains (esp red fruit punch/spaghetti sauce) out of my 4 year old son’s clothing and it works well, even better than Oxyclean in my opinion – which has a tendency to just yellow the stain). If you do try it, spray it on heavy (completely soak the stained area) and let it sit for 5-10 minutes (don’t let it dry) before rubbing it in gently. 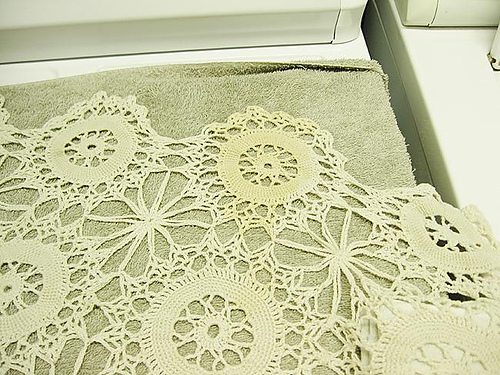 Wash in the washing machine with the warmest temp water the material can take and maybe the stain will disappear. Either way, getting the stain out or leaving it in, it is a beautiful piece of craft work! I’ll def. give Spray N Wash a try!